Steel partial material safety factor for cross-section resistance in accordance with EN1993-1-1 §6.1 and the National Annex for the case of steel buildings, or the relevant parts of EN1993 for other types of structures. It affects the resistance of profiles in axial force, shear, bending. The design resistances of the profiles correspond to cross-section resistances reduced by the partial material factor γM0 in accordance with EN1993-1-1 §6.2.3(2), §6.2.4(2), §6.2.5(2), §6.2.6(2). The aforementioned design resistances do not take into account a) flexural buckling, b) local shell buckling, c) interaction effects of axial force, shear force, bending moment, and d) interaction effects of biaxial bending. Therefore the presented cross-section resistances are indicative values applicable for special cases. In general the overall element resistance is smaller and must be verified according to the relevant clauses of EN1993-1-1 Section 6. The geometric properties that fully define the cross-section are: external diameter D and wall thickness t. The notation is defined in EN1993-1-1 §1.7 which is reproduced in the figure above. The basic geometric properties of the cross-section are calculated by using the fundamental relations of mechanics. Due to symmetry the centroid of the cross-section (center of mass) as well as the shear center are located at the center. The geometric quantities include the total area of the cross section A and the second moments of the area I, which is constant for any axis of bending due to symmetry. They are calculated by adding the contribution of the external boundary and then subtracting the contribution of the internal void. Due to symmetry the shear area is constant for shear load along any axis. The plastic section modulus Wpl corresponds to the maximum plastic bending moment when the axial force of the cross-section is zero and the stress profile is fully plastic. Due to symmetry when the full plastic bending stress profile is reached with zero axial force the section is divided into two parts separated by the axis of symmetry. The plastic section modulus corresponds to the sum of first moments of the area of the two halves about a bending axis passing through the centroid. The design resistance of the cross-section in axial force, shear force, and bending moment are calculated in accordance with EN1993-1-1 §6.2. They correspond to the gross cross-section resistance reduced by the steel partial material safety factor applicable for cross-section resistance γM0 that is specified in EN1993-1-1 §6.1 for buildings, or the relevant parts of EN1993 for other type of structures, and the National Annex. The aforementioned design resistances do not take into account a) flexural buckling, b) local shell buckling, c) interaction effects of axial force, shear force, bending moment, and d) interaction effects of biaxial bending. Therefore the presented cross-section resistances are indicative values applicable for special cases. In general the overall element resistance is smaller and must be verified according to the relevant clauses of EN1993-1-1 Section 6. The elastic bending moment resistance is applicable for class 3 cross-sections. For the case of circular hollow sections that cannot be classified as Class 3 their strength and stability verifications should be based on EN 1993-1-6: Strength and Stability of Shell Structures. The plastic bending moment resistance is applicable for class 1 or 2 cross-sections. The classification of cross-sections is specified in EN1993-1-1 §5.5. The role of the classification is to identify the extent to which the resistance and rotation capacity of the cross-section are limited by local buckling of its parts. Class 1: Plastic bending moment resistance develops and plastic hinge develops with rotation capacity adequate for plastic analysis. Class 2: Plastic bending moment resistance develops but the rotation capacity is limited by local buckling. Class 3: Elastic bending moment resistance develops but local buckling prevents the development of plastic resistance. Class 4: Elastic bending moment resistance cannot develop because local buckling occurs before the yield stress is reached at the extreme fiber. 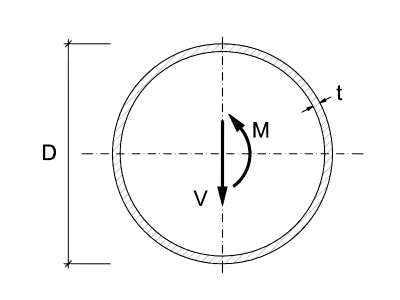 Effective widths are used to account for the effects of local buckling of compression parts. For the case of circular hollow sections (tubular sections) that cannot be classified as Class 3 their strength and stability verifications should be based on EN 1993-1-6: Strength and Stability of Shell Structures.